This year the new three-day Galway Races October Festival that takes place Saturday 27th through to Bank Holiday Monday 29th will have an exciting new look and feel, continuing racing and glamour into the winter months and even more importantly all in aid of a great cause. As part of this new October Festival and with it being Breast Cancer Awareness month, Galway Racecourse are partnering with the National Breast Cancer Research Institute to host a dedicated fundraiser for the organization on Sunday 28th October called ‘Race in Pink’. The National Breast Cancer Research Institute is an Irish charity that raises funds in support of the breast cancer research team lead by Professor Michael Kerin based at the Lambe Institute, NUI Galway. 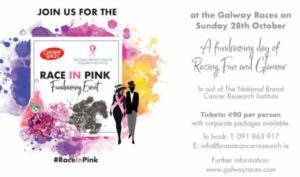 As part of the Race in Pink event, the team at Galway Racecourse have put together a fantastic hospitality package to create a fun-filled day for those attending in support of such a worthy cause. Guests will experience the ultimate day at the races with panoramic views of the racetrack from the iconic Killannin Stand while enjoying a drinks reception followed by a delicious three course lunch with wine. A live band will keep everyone entertained and there will be prizes galore. Tom Lee RTE Racing presenter and celebrity tipster will help you be a “Winner Alright”, but the real winner will be the charity as it’s hoped the event will raise significant funds for the National Breast Cancer Research Institute. The National Breast Cancer Research Institute is a national charity that raises funds in support of research at the Lambe Institute for Translational Research at Galway University Hospital. By funding this research, the charity aim to positively impact future outcomes for breast cancer patients. Working in collaboration with universities and hospitals across the globe, the research team are focused on areas including personalised medicine, breast regeneration, and innovative diagnostics and therapeutics.